The Hoover Carpet Basics Power Scrub Deluxe Carpet Washer FH50150 is a lightweight carpet cleaner that packs in a lot of cleaning power to rival Hoover’s popular classic, the SteamVac F5914-900. Amongst Hoover’s line of upright deep carpet cleaners, it incorporates a streamlined design that makes it lightweight and very easy to operate. Does it deliver? In this review, we will cover it’s main features and benefits, what users’ like best, customer reviews, and how it compares to other best rated carpet cleaning machines for home use. SpinScrub® Technology – The Hoover Power Scrub Deluxe Carpet Washer FH50150 incorporates Hoover’s tested and proven Spin Scrub technology. The brushes spin in a counter-rotating 360 degree manner to clear out the most difficult pet and high traffic stains embedded in the carpet. The level of deep cleaning is first-rate. Removable brushheads – After each cleaning, the brushes can be easily dismantled so hair and other debris caught in them can be cleared out. This allows for easy maintenance. Users can easily keep the brushes in excellent condition for many cleanings to come. Great Horsepower – The machine operates on 10 amps of power. This is high and is just a tad less than what a professional grade machine like the Rug Doctor runs on. Light Weight – The machine weighs about 19 lbs. This is the lightest weight for a machine in its class. Yet it packs enormous cleaning power. It has a great cleaning nozzle width of 11.25 inches, similar to the Hoover Steamvac Carpet Cleaner With Clean Surge F5914-900. Clean & Dirty Water Tanks Separated – This allows for easier filling and change of water. There are no hassles with the water mixing up. Hot Water Cleaning – Users like the choice to use hot water for cleaning as it allows for better cleaning effectiveness. Separate Detergent Compartment/ Rinse Only Mode – This makes it easy to rinse off the carpets anytime after cleaning them with detergent. There is no need to refill an entire tank of water without detergent just to do rinsing. For pet owners and parents of children, it makes them feel safer that the carpets have less soap chemicals left over. Lots of Handtools – The package comes with a wide array of hand tools for cleaning out every corner of the home, upholstery, plus car upholstery and rugs. Besides a powered SpinScrub hand tool, there are also an upholstery tool, crevice tool and stair tool. In addition, users like the flexibility of the 8 foot hose included. The tools are easy to attach and put in action as well. There is even a mesh storage bag to keep all the hand tools in to be conveniently placed or hang in the store room. Long cord length – The power cord is 20 feet long. This allows for lots of cleaning to be done without having to unplug and move. 2 Year Warranty – There is a 2 year limited warranty offered by Hoover. Hoover has authorized service centers around the country and they are good about supporting their warranty. 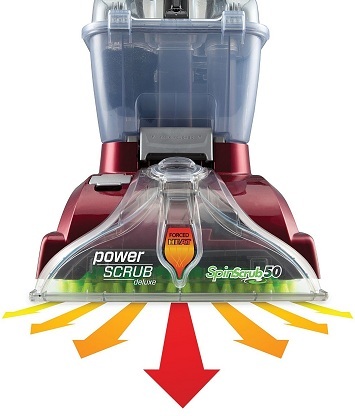 Model Variations – The Hoover Power Scrub Deluxe FH50150 pictured here in red is the main Power Scrub upright deep cleaner model sold online and in stores. There is another model called the Hoover Power Scrub Carpet Cleaner, FH50140RM. This is actually a refurbished Hoover Power Scrub Deluxe sold through the Hoover Outlet Store on eBay. It may come in blue or another color instead of red. [NEW] In Feb 2017, Hoover introduced an expanded version of the Power Scrub Deluxe FH50150. The new model is called the Hoover FH50251PC Power Scrub Elite Pet Carpet Cleaner. It includes a few extra features like having dual “deep clean” and “quick clean” modes, Antimicrobial SpinScrub Brushes, edge cleaning brushes and a larger 1.25 gallon tank size (see comparison). The deep clean mode is for regular deep cleaning and the quick clean mode for a quick clean-up and faster drying. The weight of the machine is under 19 lbs (without water), which is similar to the Power Scrub Deluxe. All these added features make this a more versatile cleaner. So far, customer feedback has been positive. Which one should you buy? 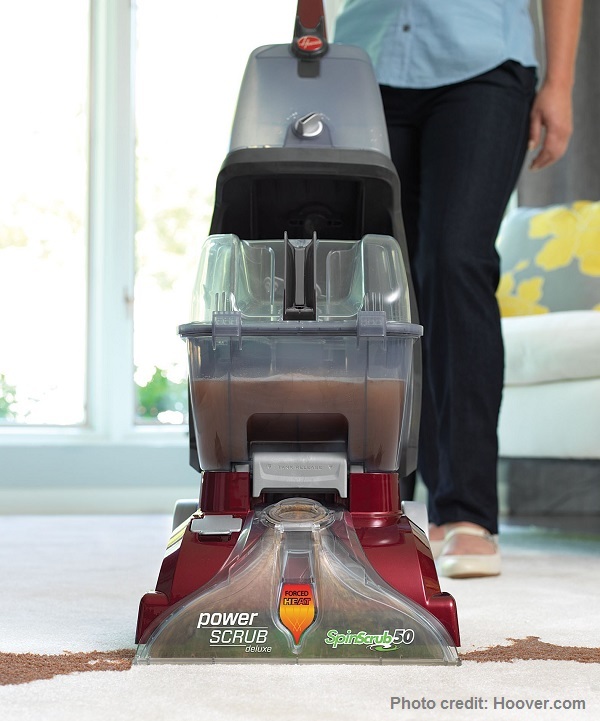 The basic Hoover Power Scrub Deluxe has lots of great features packed into it. It works well for most people, including pet owners. If you can get it for 20% to 30% less than the newer Power Scrub Elite FH50251, it’s hard to go wrong as the default choice. If you are not on a tight budget and like to enjoy even more convenience (eg. perform quick cleanings, less frequent refilling of tank), then the enhanced Elite version makes good sense. If you are interested, you can check out our full Hoover FH50251PC Power Scrub Elite Pet Carpet Cleaner review here. The Hoover Power Scrub Deluxe Carpet Washer FH50150 rates highly in cleaning performance. One user compared it to the Rug Doctor, and he said he was able to obtain similar results, but was pleased that this machine cost so much less. A number of pet owners with horrendous stains also speak highly of the cleaning results provided. Whether it was a pet poop accident, juice or coffee stains, the SpinScrub technology incorporated in this machine has been known to work wonders. 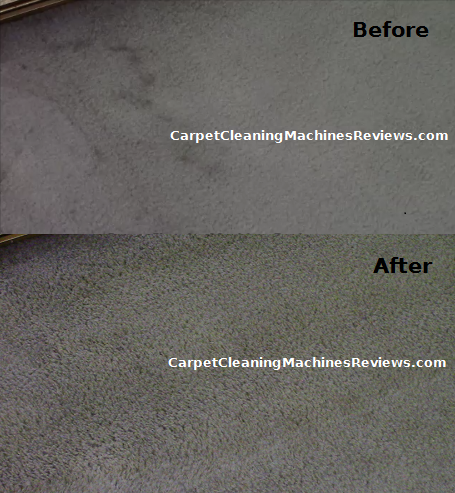 Here are some comments from user reviews: “made a world of difference,” “high traffic areas sprang back life,” “took out the entire stain on my off white carpet.” For it’s outstanding cleaning performance, we have ranked it the top machine alongside the Hoover SteamVac on the Carpet Cleaning Machines reviews page. The Hoover Power Scrubber is easy to assemble and handling is convenient and smooth. The water tanks are easy to fill and drain as well. As the newest Hoover model, it benefits from the feedback from previous models and the knowledge base of Hoover engineers. Sometimes, the upgrading of features and design can still miss the mark. However, since the release of this model in late 2012, customer reviews have been overwhelmingly positive in regards to how reliable and easy this machine is. Owners of older Hoover carpet cleaning machines sometimes have problems snapping the tank and lid in perfect alignment, and this has led to complaints of leakages. This does not seem to be a problem here anymore. Uses reported successfully using this machine on both Berber and Shag/Plush type carpets. One user mentioned that she tried it on frieze carpeting as well, and it worked fine. 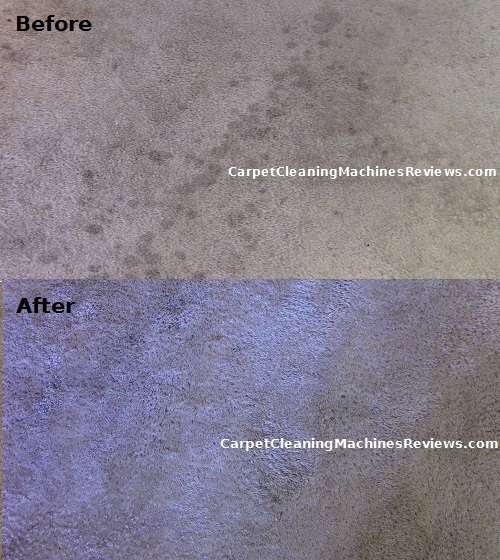 We tested the machine on both Berber and Shag/Plush carpets and it cleaned well on both. Hoover itself refrains from saying that their machines will definitely work on 100% of all carpets. We did not find any explicit warnings for carpet exceptions in the Hoover Power Scrub manual. When in doubt, it may be worth calling their customer support directly. The manual did mention to only to clean upholstery that is marked with “W” or “W/S” for cleaning. Some upholstery can only be dry-cleaned and thus cannot be cleaned with a wet cleaner brush. According to many users, their carpets dried really fast after using this machine. The actual time varies; a number of users reviewing the product point out that it took about 3 hours on average. Low pile carpets usually dry faster compared to thick pile or plush carpets. Really plush carpets can take more than a day to dry, even with this cleaner. The Power Scrub Deluxe Carpet Washer FH50150 has a mechanism that passes hot air to the carpet, helping it to dry faster. The machine also includes Hoover’s Max Extract DualV Nozzle Technology that adds suction power to pull up the water in the carpets. This carpet shampooer is lightweight and compact for its class of machines, making it easy to move around and store. It weighs 18.1 lbs (without water), which is probably the lightest machine you will find for the class of regular home deep carpet cleaners. Many users like that the machine maneuvers easily, and it is also less intimidating to roll out and put to use. It is great for multi-storey homes. Before and after. See description below. The difference is color is mainly due to different lighting conditions, but you can see the spots are mostly gone. Before and after of a very dirty patch of carpet next to the kitchen area. We able able to remove a lot of the stains and spots and refresh it quite a bit with the Hoover Power Scrub Deluxe FH50150. The color of carpet looks different is mainly due to different lighting conditions. However, the cleaning did make the carpet look brighter. This carpet was last steam-cleaned 5 years ago using a Rug Doctor machine. It has become somewhat disgusting with time and a lack of care. The spots and stains have built up over these years – they are not fresh stains. The ugly diagonal spots were almost fully lifted out. It took a lot of work but the great results made it worthwhile. If we could give a word of advice, try to wash your carpets at least once a year. The longer the dirt and stains languish, the harder it is to remove. In this example, the neglect and lack of regular cleaning has made the carpet dull and worn down the carpet threads. Easy to use – Assembling the machine, as well as snapping in the tanks are easy. The brushes are removable for easier maintenance. Feedback and reviews from customer indicate that this model is probably the easiest to use compared to the Hoover SteamVac and Max Extract models. Rinse/Wash Selector – The rinse selector switch makes it easy to rinse carpets ie. wash without detergent. Using models without this feature to do a rinse run is more troublesome. The user would need to fill a new tanks of water without detergent to clean. Lightweight – This machine weighs about 18 lbs (before adding water), the lightest of all regular Hoover home carpet cleaning machines with similar cleaning power. Best Handtools – Of all the Hoover home carpet cleaners, this one has the best and most complete assortment of tools. Everything can be cleaned well: from crevices, to stairs and nooks, sofas and other upholstery, to car upholstery and car mats. Low Cost – The Power Scrub Deluxe FH50150 is priced to sell. Good Design – The machine has a streamlined design and all parts fit well. Smaller capacity – The flipside of it being a lighter weight cleaner is that it has less capacity. It has a similar water tank capacity and path width coverage to the Hoover SteamVac with Clean Surge F5914-900, but is smaller than the Max Extract models like the Hoover MaxExtract 60 PressurePro. Not commercial quality – In terms of construction and build, this is a typical home-grade upright cleaner. It does not have the workmanship and quality of a commercial grade machine like the Bissell Big Green Deep Cleaner 86T3. If you like something better constructed, take a look at the Rug Doctor Deep Cleaner. Hard to see when clean water has been used up – The clean water tank is translucent but dark, so it’s hard to clearly tell when the water has been used up and that it’s time to refill. Fortunately, the machine has a feature that will shut the suctioning down when the dirty water tank fills up, so the dirty water will not overflow. No multiple brush speeds – The machine operates on only 1 speed. Most users do not find this an issue, but we are noting this in the review in case some readers want to know. Check out the Best Carpet Cleaners For Home Comparison Chart for a side-by-side comparison. 1. Be sure to review the manual provided. There are lots of helpful guidance and tips provided in the manual to help users get the maximum mileage out of their cleaning machine. The Power Scrub Deluxe Carpet Washer FH50150 is more user friendly and fun to read than manuals for earlier machines. It also includes lots of pictures for illustration. 2. Clean the brusheads. Take a little time to clean the brushes after you are done with the carpet cleaning. The brushhead assembly can be easily removed. You can then run the brushes under running water to clean out the debris. This ensures that hair and other debris does not hamper the movement ofthe brushes in the next cleaning. 3. Use Hoover branded detergent. Hoover recommends using their company branded cleaning detergent for use with this cleaner. This ensures optimal performance for the cleaner, as well as prevent the possibilities of damage to the machine. According to the user manual, one recommended cleaning solutions for the Power Scrub Deluxe Carpet Washer is this: Hoover PetPlus Concentrated Cleaning Solution (For pet owners or heavily soiled carpets). Should you buy the Hoover Power Scrub Deluxe Carpet Washer FH50150? If you need a machine that gets soiled carpets really clean and is very easy to use, the Hoover FH50150 Carpet Basics Power Scrub Deluxe Carpet Washer will address that. It includes the best features that users have found the most helpful for cleaning performance. Overall, the Hoover Carpet Basics Power Scrub Deluxe Carpet Washer is the best choice if you are looking for a comprehensive combination of benefits for one low price. It offers superior cleaning performance, easy handling, convenient carpet rinsing and handtools that will reach all nooks and corners. For additional comparisons, look at the List of Best 10 Machines on the Carpet Cleaning Machines Reviews page. This device FH50150 Carpet cleaning machine works great. cleanliest environment means a lot to me and my cat. Love your reviews, they are honest, accurate, and explains so much about the product. Thank you.